The Visa international payment system will be forced to pay a guarantee fee estimated at $60 million for the first quarter of 2015, as it will be unable to transfer Russian domestic processing into the national system of payment cards (NSPC) by April 1. Visa will pay roughly $200-300 million a year, or about $60 million per quarter, says RBC citing sources close to the Central Bank of Russia. Visa apparently won’t manage to meet the target date, so it will continue to use capacity in the US after April 1, said the news agency. The Central Bank of Russia "shifts the responsibility on Visa, believing that it is to blame, as it took too much time to solve the issue of connecting to the national system of payment cards. If it doesn’t have time to transfer traffic, let them pay a fee,” people familiar with the matter told RBC. Visa doesn’t comment on its plans, but the payment system’s representatives earlier said they were ready to leave Russia so that they didn’t have to pay the fee. The other major international payment system MasterCard will avoid penalties, as it transferred its processing of Russia’s operations to the country’s national payment system on time. The bankers surveyed by RBC say that their customers will not notice switching to the national system of payment cards on April 1. At the same time they unofficially admit that Visa’s readiness to carry out transaction processing through the national system of payment cards is practically at zero. "If 80 percent of MasterCard transactions are already carried out through NSPC and by April 1 the figure will be at 100 percent, the share of Visa is at the same time less than 10 percent," RBC quotes an employee of a leading Russian bank. 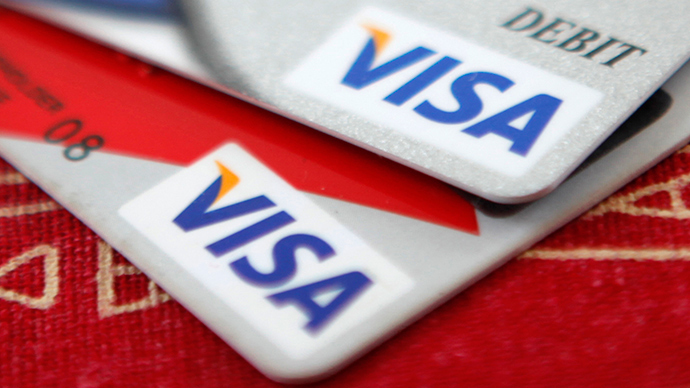 Visa will have to use their operational center to prevent failures. On March 25 Vedomosti reported that Visa was behind schedule to transfer to Russia’s NSPC. Deputy Finance Minister Aleksey Moiseev said there were two options for those in arrears: either to deregister as a national payment system or to pay a deposit. Moiseev stressed that Visa didn’t ask the Ministry of Finance to extend the period of transition to the national system of payment cards. "And if they did, we would be unlikely to make advances," he said. Under the new legislation adopted last May, March 31 is the last day for international payment systems who want to work in Russia to transfer local processing operations to the national system of payment cards (NSPC). Otherwise, they will have to make a security deposit to the Central Bank. Together Visa and MasterCard have 95 percent of the Russian market. According to Morgan Stanley, both payment systems would have had to pay $3 billion in guarantee fees to stay in Russia, if both of them had failed to transfer Russian domestic payments to the NSPC. The idea to establish the national system of payment cards was proposed last year after Visa and MasterCard froze transactions via their cards issued by banks that were facing Western sanctions.